Analog Artist Digital World: Panera Bread by Lake Eola. I'm starting a series of paintings of Lake Eola. The plan is to do consecutively larger oil painting to break away from the watercolor I do every day. 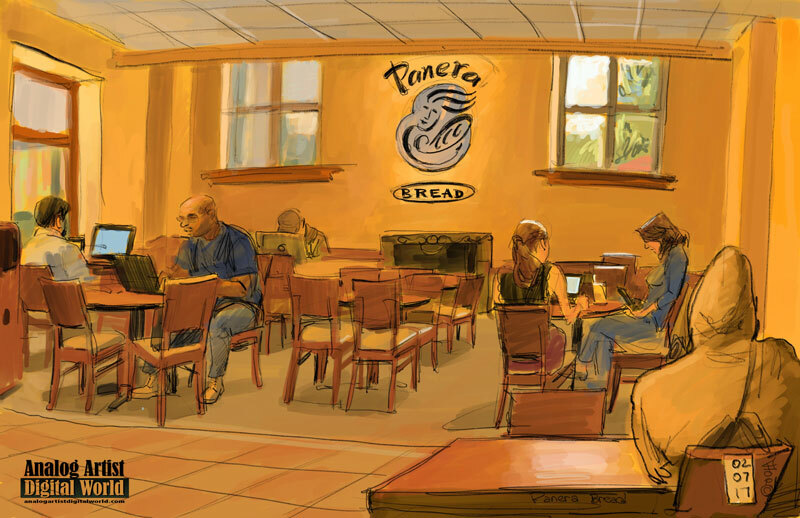 Panera Bread at Lake Eola (227 N Eola Dr, Orlando, FL 32801) has become a place where I like to eat and relax before or after painting. There are alwa5s people hanging out and working on their computers which makes them captive models. I am also working on a book about sketching on cafes, so there will be many more sketches and articles about Orlando's best Cafes here on Analog Artist Digital World. I have also discovered that the Saturday Lake Eola farmer's market is a vibrant place to sketch. There was a health and fitness fair last week and the huge grass lawn in front of Panera was filled with people doing yoga. There were three groups, the beginners, intermediate and then the advanced students who were paired up and doing calisthenic poses. (the person would lie on the mat and 6se their legs to elevate their partner. The partners pelvic bone would be supported and when they leaned forward they would look like they were flying. Really ambitious students did hand stands with their shoulders supported by their partners feet. There was a spotter on hand in each case to be sure no one got hurt. I'm not that ambitious, but I do want to catch the gestures. Panera bread will be closing at the Lake Eola location this year. Panera wants to have drive throughs at their restaurants and this lovely 1920s building doesn't have that option. There is construction going on to improve the roofing but that probably doesn't have anything to do with the move.